Explore the Top Things to Do in Aachen! 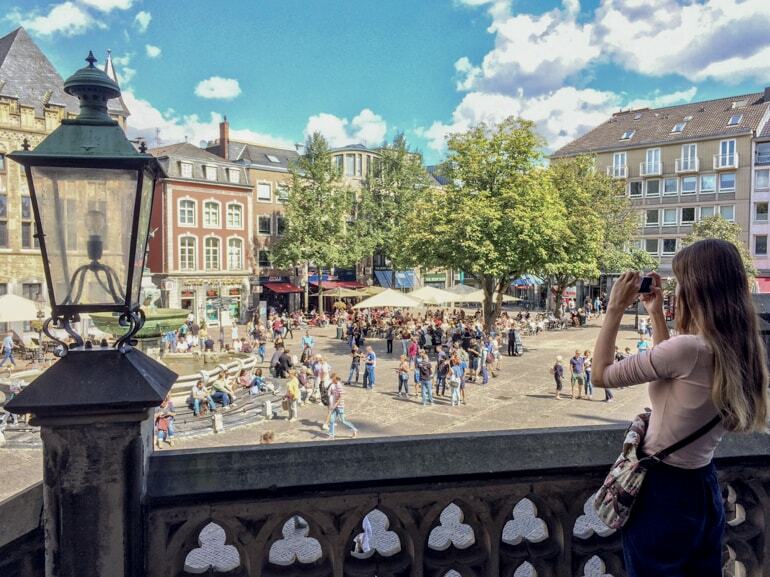 Lots of people ask “Is Aachen worth visiting?” and we think the answer is yes! This small German city is tucked away beside a few bigger cities like Cologne and Düsseldorf. This truly makes it a hidden gem because you might pass it by if you aren’t looking! 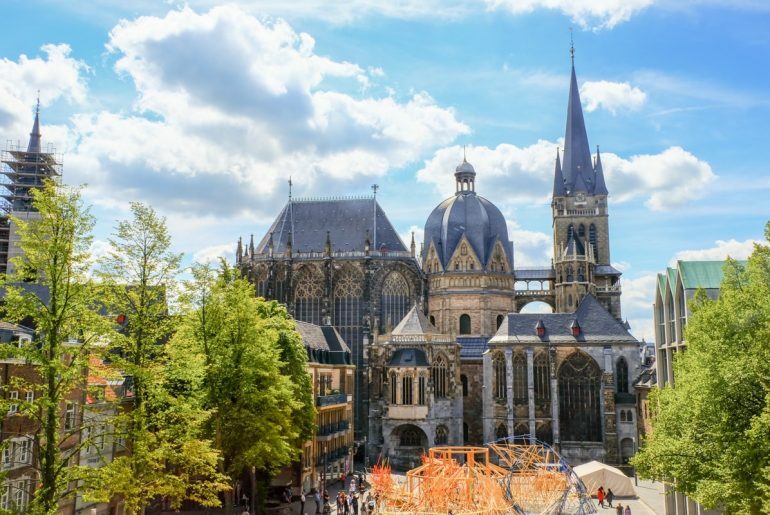 Aachen is famous for the Aachen Cathedral, its stunning Rathaus (City Hall), a beautiful old town with cafes and restaurants, and many other attractions. From many great sights in the historic centre to day trips from Aachen that are sure to please any interests – we love exploring the city and we think you will, too! There are even things to do in Aachen at night that are worth your time! Since we live so close to the city now, we got the chance to take a city break and play tourist for the day. It’s quite fun! 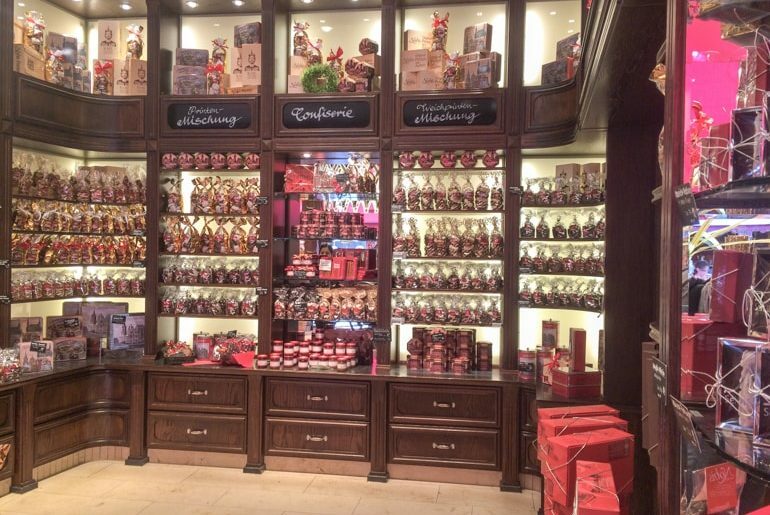 In this post, we cover all the best Aachen tourist information like the beautiful thermal baths to the best things to buy in Aachen – including the famous “Printen” sweet treats! 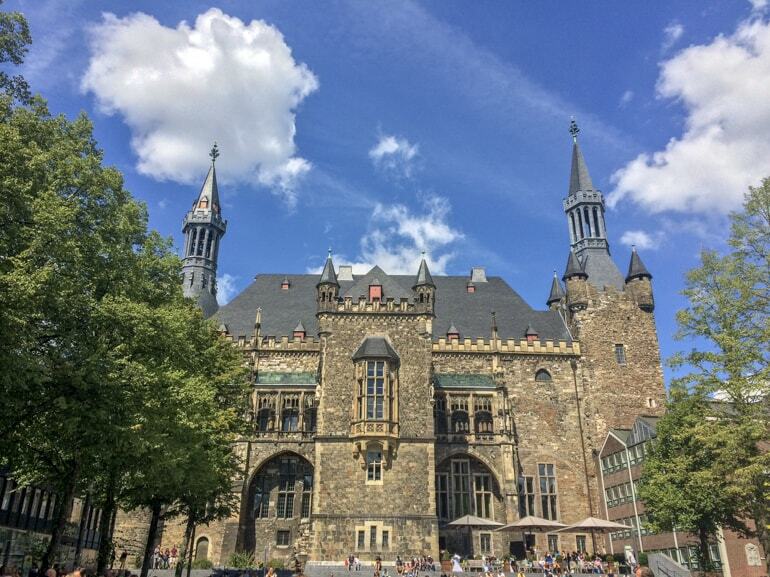 So, if you’ve got your walking shoes on – let’s check out Aachen! Check Out Beautiful Wiesbaden or Mainz Just Down the River from it! Aachen is the most western city in Germany. If you are visiting Germany for the first time, you can find it tucked away to the south and west of larger German city centres like Cologne and Düsseldorf. Because of its location, it’s also very, very close to the border with the Netherlands and with Belgium. 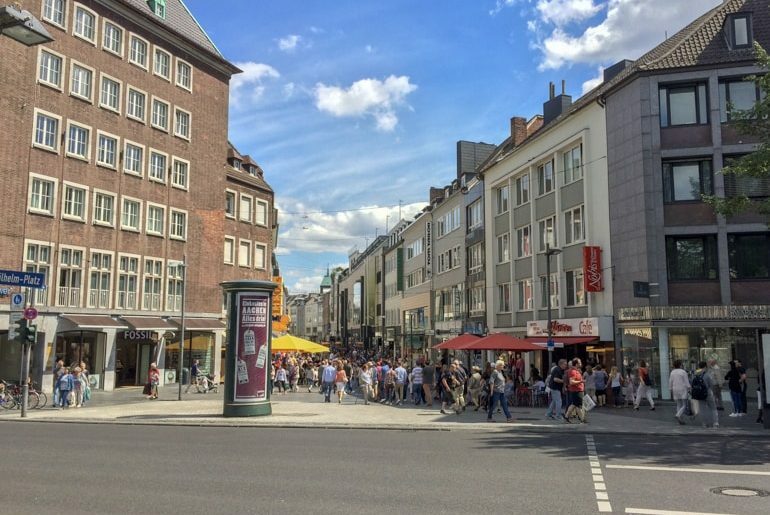 Because of Aachen’s location in the most western part of Germany, getting there can be easier or more difficult depending on where you are travelling from. The good news is if you are coming from neighbouring countries such as the Netherlands and Belgium, Aachen is VERY close to both borders so getting there from those countries is pretty easy. If you are taking a train from the south of Germany – such as Munich – you’ll have to change trains at least once, sometimes even twice. Frequent connection stops are Frankfurt am Main or Cologne. Since the distance from the south of Germany to Aachen is quite far, you’ll most likely take an ICE at one point in your journey (which would still be at least 5.5 hours). As you might know, train tickets including an Intercity Express Train can be more expensive. Therefore, we would recommend booking a ticket as early as possible. You can look for connections on the DB Website. 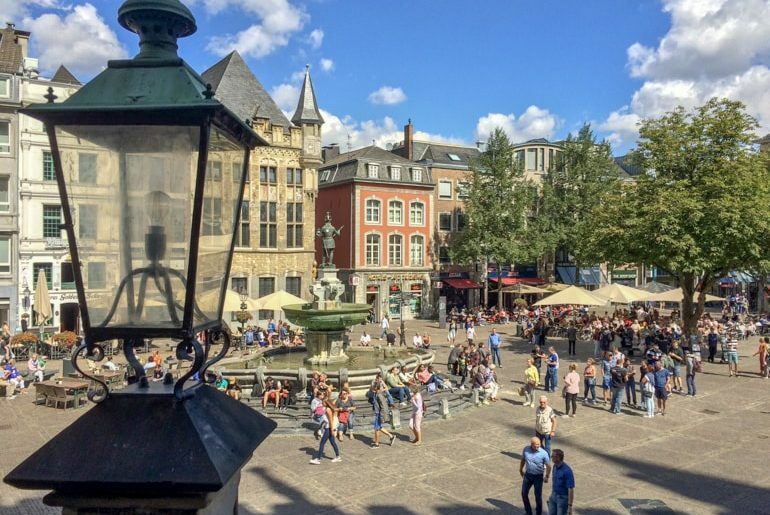 Visiting Aachen from Belgium is pretty easy with a train from Brussels only taking about one hour. An ICE or Thalys train from Liege would be even shorter with journey times being as short as 20 minutes. You can check the schedule for trains from Belgium to Aachen on the DB Website as well. If you are travelling to Aachen from other parts of Germany (or Belgium and the Netherlands) and don’t want to or can’t take the train, then you might opt for a bus instead. You can check the Flixbus Website to see if there is a route available that works for you. Generally, bus tickets are cheaper than train tickets but your journey time can be significantly longer. When travelling to Aachen from the Netherlands, you’ll most likely take a bus to Aachen. 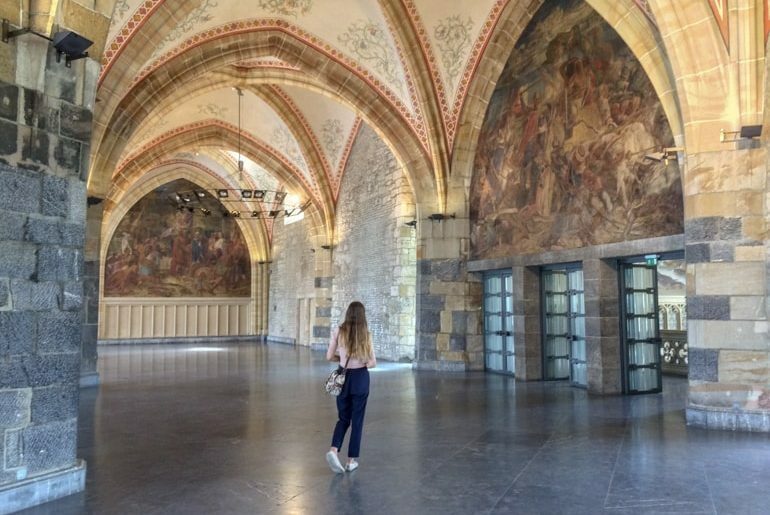 Depending on where you are starting your journey, one option would be to take a train to Maastricht and then take the Bus 350 all the way to the centre of Aachen. You can check your journey options on 9292.nl. Discover a Larger German City – Check Out the Port City of Hamburg! The original Town Hall building (buried in the foundations) are from the year 800! 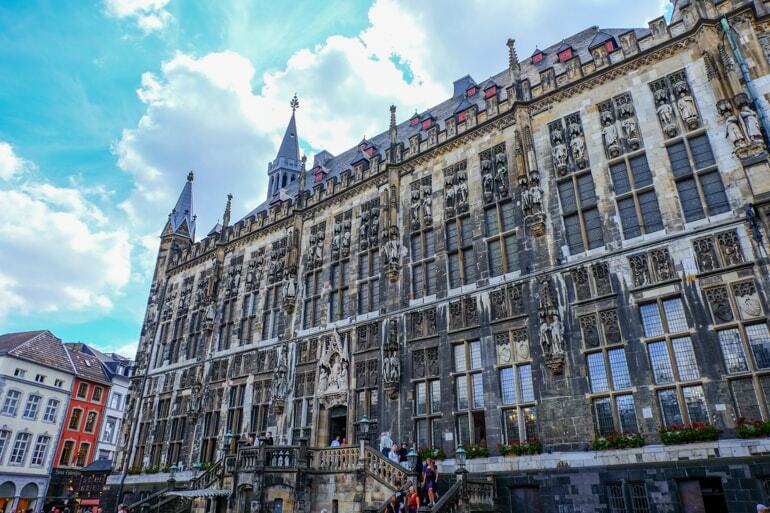 Aachen has a LONG and complex history – but it’s actually super interesting. Originally, the area was settled because of the hot spring activity. There is a well-documented history of Neolithic tools and settlements in Aachen (like 2500 BC). The Romans eventually took an interest because of the hot springs and their healing powers. After the Roman Empire fell in Aachen, Charlemagne – also known as Charles the Great – was an emperor of the Franks. Around the year 800, he spent most of his time in Aachen, making the city his seat for a large Carolingian empire. For the timeline in Europe, this was quite the place of importance. Into medieval times, the outer walls and fortifications were built to help defend the city from invasions – and these walls were ripped down in the late 1800s so that the city could build out and physically expand. During this time, the city changed hands a few times given that the area of Western Europe (current France, Belgium, Netherlands, etc) was a popular spot for people to invade or be invaded. Aachen also had a pretty big fire in 1656 and they rebuilt in a Baroque Style from the previous Gothic style. The city became an industrial centre in the early 1900s, was occupied by Allied Forces after World War I until 1930, and was bombed (pretty heavily) during World War II. It was actually the first city liberated during World War II (because it’s so far west). 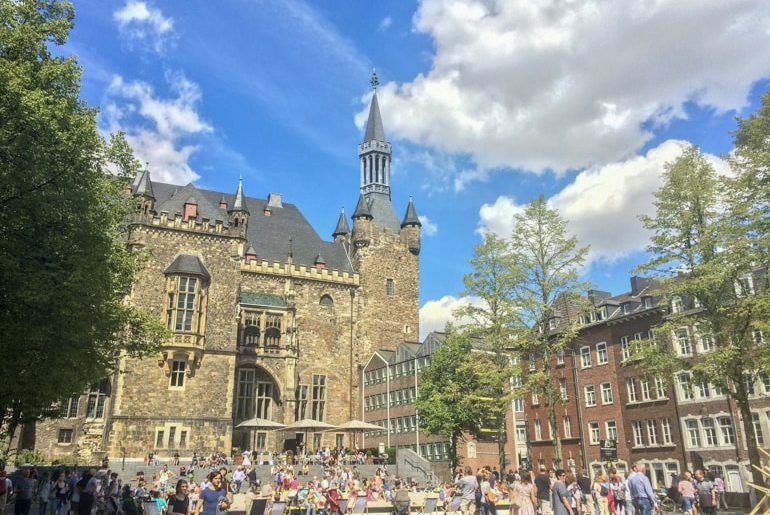 Today, Aachen is a centre for innovation and technology in Germany, and proudly shows off its crazy history through museums and exhibits. 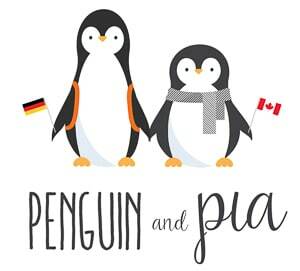 Learn German Before You Travel – Helpful Phrases and Words As Told By Lisa! 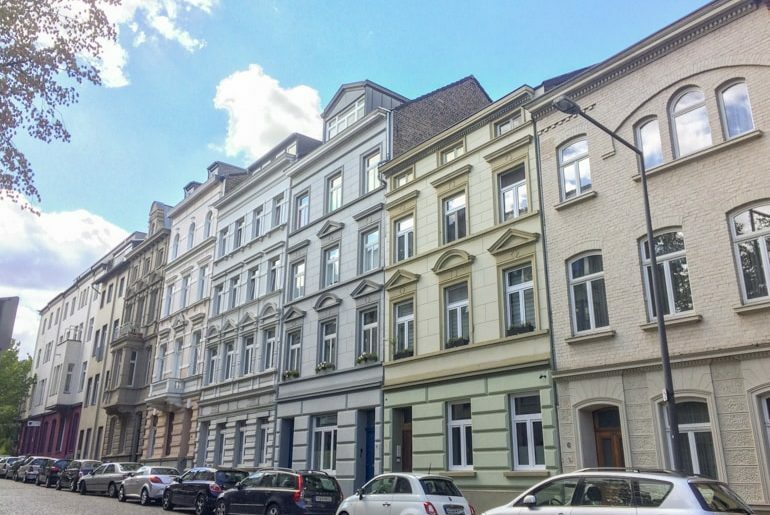 There are lots of beautiful neighbourhoods in Aachen. If you are looking for hotel or accommodations in Aachen, there are quite a few places to choose from. That said, Aachen is s smaller city so booking in advance might be a good idea – especially in the high summer season. Check here for the Latest Hotel Deals in Aachen! There are not a lot of hostels in Aachen since the city is quite small. However, if you are looking for a cheap place to stay you can look at A&O Hauptbahnhof. We stayed there in a private room when visiting Aachen for the first time and it was fine. In fact, we added it to our list of awesome German hostels we’ve stayed at. We trust Hostelworld – so feel free to browse for other hostels in Aachen. 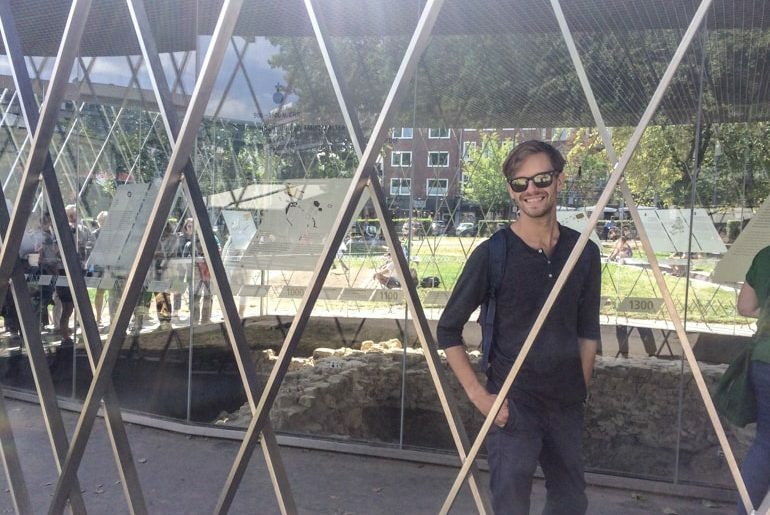 Ok, here we go – the best things to do in Aachen! This is just a short list but we’ve definitely covered most of the well-known attractions. There are also a few things that we did that might interest you! If you know us, you’ll know that we are a big fan of free walking tours. They have been the best way to discover a city with a local and a very fair price (tips only). We haven’t done it but we’ve seen the signs around the city. 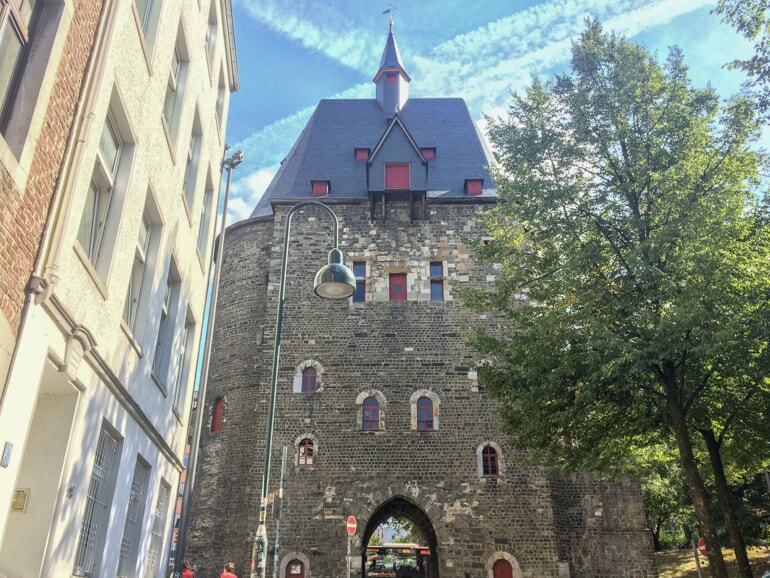 Aachen has a free walking tour available in multiple languages. The tour is apparently very highly rated by the people who do it! If you want to start off your Aachen adventure with a tour, then check out their website for more info and tour times! Aachen Cathedral from a window inside City Hall. Completed around the year 805 – not 1805, but 805 – the Aachen Cathedral has been welcoming visitors for centuries. The Cathedral is one of the oldest in all of Europe. It was mandated to be built by good old Charlemagne. Incorporating three different architectural styles, serving as burial grounds for various important historical figures, and having survived the Second World War, it’s no wonder the church is so popular. The entrance to the Cathedral with the ticket office directly behind you. The Cathedral was actually one of the first things in the world to be placed on the UNESCO World Heritage List in 1978. We got a chance to go inside and we can only recommend it! You don’t have to pay to enter the cathedral. If you want to take photos once inside or participate in a tour, you can do so for a fee. You can learn more about prices, guided tour languages and hours, and opening hours at the official Aachen Cathedral website. The Marschiertor Gate towering over the area. The city was surrounded by medieval walls back in the 14th century like we mentioned briefly above. Today, these walls have been demolished. The only remaining structures are two gates: Marschiertor + Ponttor. We walked through the Marschiertor. The structure itself is sort of in the middle of a normal neighbourhood but if you stumble upon it you can’t help but be impressed by the sheer size of the structure. They even have the old wooden doors in place (but opened). You can’t go up the gate tower or anything but there is some information to read at the base. We wouldn’t say make a point of going but if you are walking to the main train station from the city centre, swing by for a look! The other gate is called the Ponttor and you can find it at the address below in the north end of the city centre. The entrance to the museum is just up the stairs! Also called the Rathaus in German, Aachen’s City Hall has an incredible history behind it. Located in the city centre beside the Marktplatz, it’s a very popular area for cafes and photographs. Inside the hall, you can join a guided tour or just pay 6 euro and do a self-guided walk through. We paid the entrance fees, grabbed an English brochure, and off we went! Eric reading the pamphlet in the White Hall and being super touristy. Not to give away to many details, but the building is sitting on the original foundations of the ‘Palace of Aachen’ that dates back to the year 800! The fact that this exact area of the city (and of the region) has been so important for centuries really makes you feel like Aachen is more than just a small city to wander around. 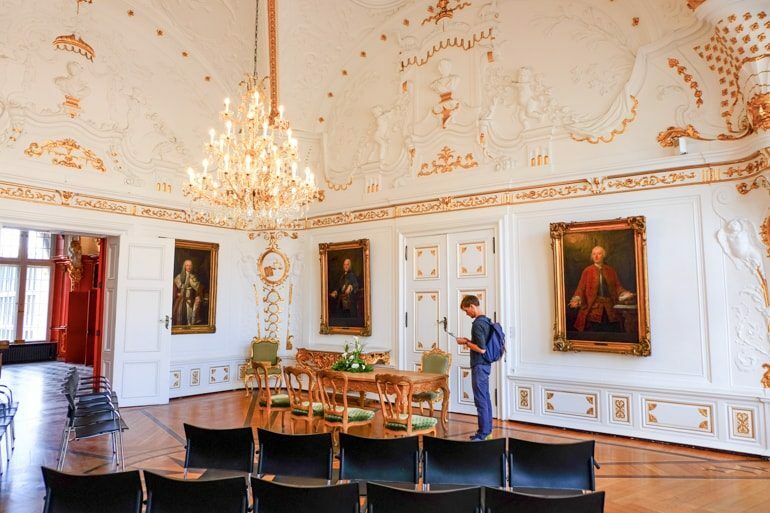 Inside the Rathaus, you’ll find lots of different rooms all dedicated to different functions. They are all decorated differently and have lots of information about what you’re looking at. The decorations are beautiful in each room. One of the rooms has a video playing where you could learn more about Aachen during the Second World War. We sat and watched it for a few minutes before carrying on. On that same bench, you’ll even find telephones with audio guides that all discuss something different. Lisa listened to the audio commentary on Resistance Fighters while Eric listened about the role that Eastern European labour workers played in Aachen during the war. At the top of the Arc Staircase, you’ll reach The Coronation Hall. Once you’re done on the ground floor, you can go up a few levels using the Arc Staircase. 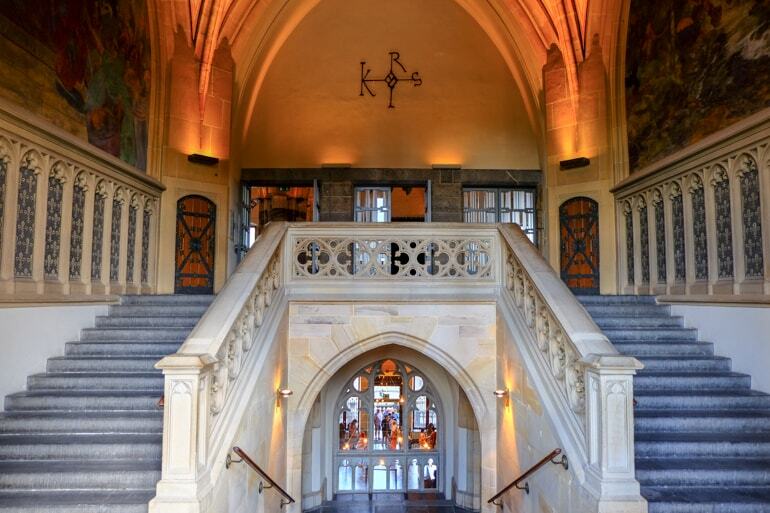 Built in the mid-1800s, this staircase gives you great views of Aachen cathedral through the windows. Along the stairs, there are interactive screens where you can learn about award winners and other important people in the history of the German city and of the City Hall. Lisa getting lost in The Coronation Hall – no, seriously. It’s huge! At the top, you can wander around the grandeur of the Coronation Hall. Used for award ceremonies at the Town Hall, this massive room is quite the place. Unfortunately, the windows have a finish on them that makes them not great for city views but the art and stonework of the room is still worth the short climb up. Overall, we’d say you should check out the City Hall for the beauty and the history to be learned. 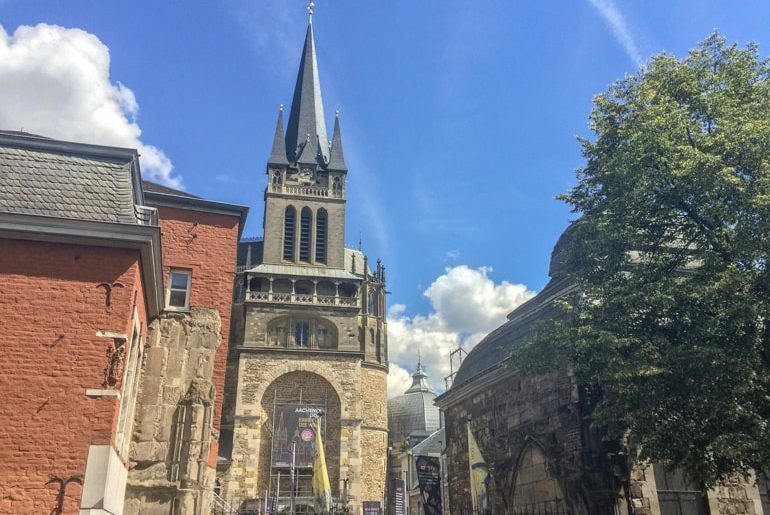 We found it very interesting even on a self-guided tour and it made us appreciate Aachen as we wandered around! You can learn more about the City Hall at the official website. Remember all that history we’ve been talking about so far? Well, there’s a place in Aachen dedicated to explaining and showcasing all of it! The interactive and modern museum is divided into six sections – each portraying a different time in Aachen’s history. We didn’t get a chance to go but we REALLY want to now that we’ve learned more and more about the city. They also have guided tours and audio guides if you want a self-guided experience. To learn more about the opening hours and admission prices, visit the official website for the Centre Charlemagne. The main pavilion – which is right beside the hustle and bustle of the city’s main bus stop! 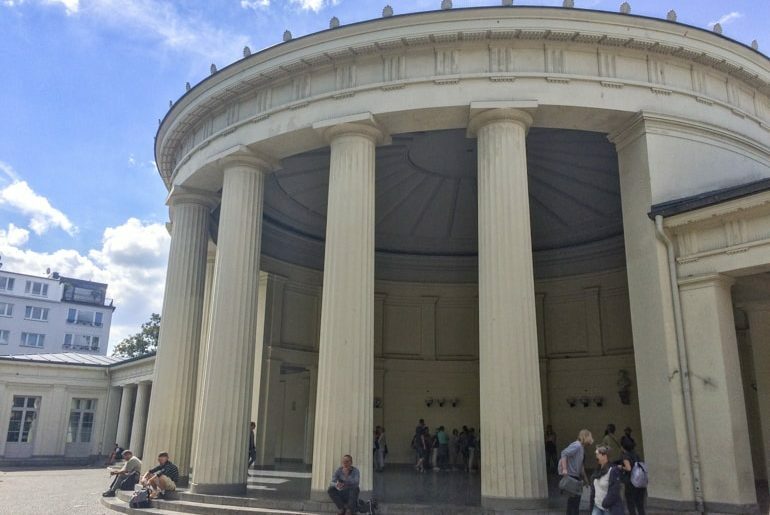 If you walk through downtown Aachen you’ll come across an old pavilion that looks sort of out of place right beside a major road. Well, you aren’t seeing things! This is the Elisenbrunnen! The original classical building was built in 1827 to represent the spa culture in Aachen. Practically speaking, it was (and still is) a pump house for water from the “Kaiserquelle” spring. The original was destroyed in bombings in the Second World War and the current one was built in the 1950s. Try the water on your hands – it’s very warm and really nice! 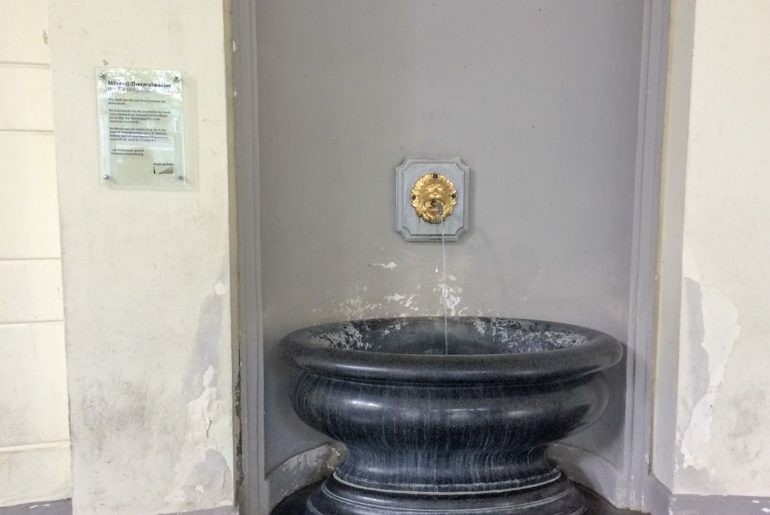 Today, when you walk inside the pavilion, you’ll find two sulphurous drinking fountains with a little bit of information on wall plaques (in German). They might have been drinking fountains in the past but these days the signs say DO NOT drink. So, we washed our hands in the warm water and it was super refreshing. You don’t expect hot water to be pouring out of a fountain in the middle of the city! 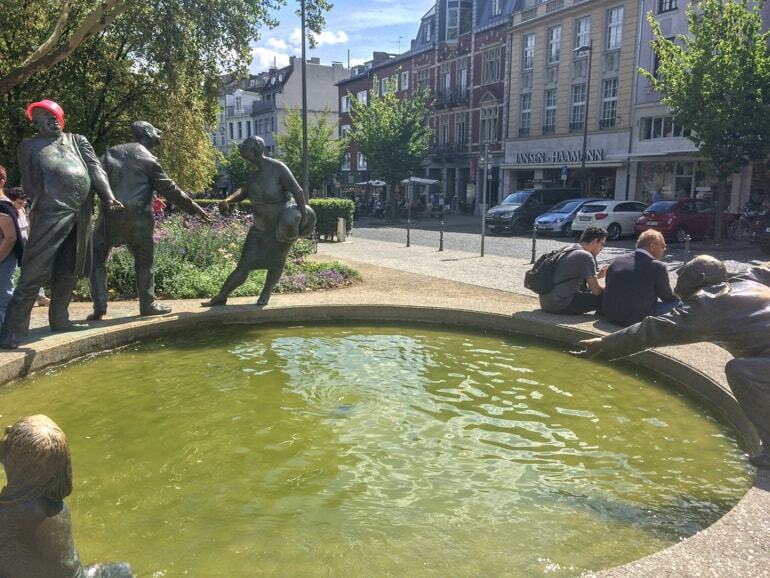 Let’s just get this out of the way early on: Aachen has a TON of fountains. There are even one or two we have photographs of that we didn’t include because it would just be too much. So, we’ve listed a few of our favourites below. You can see these wandering around the Old Town. 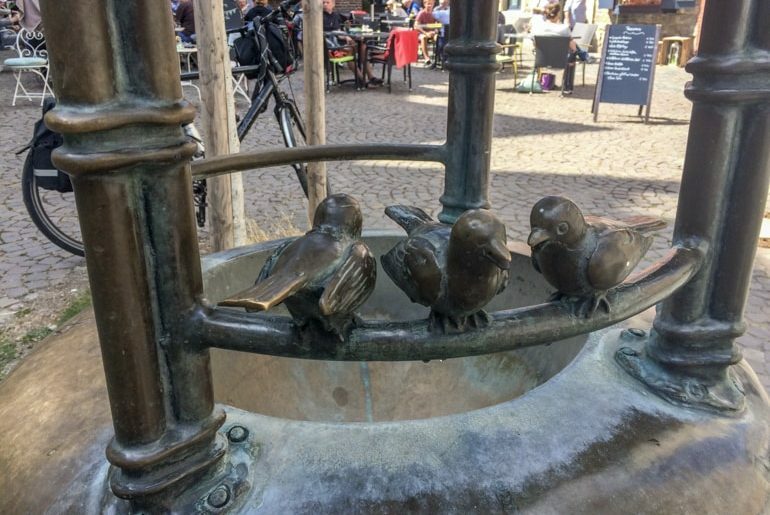 One of the most famous is the Puppenbrunnen, which is a small fountain with moving parts. Unfortunately, it was covered over when we visited – likely for restoration works. You can find it here: Krämerstraße 27, 52062 Aachen. Another popular one that we did see but didn’t photograph is the Hühnerdieb, which depicts a thief stealing a chicken from the “Chicken Market” area. The joke is on him, though – the fountain shows the moment he realises he has stolen a rooster instead! You can find him located at Hühnermarkt, 52062 Aachen. One that we did stop to have a longer look at is the Kreislauf des Geldes Brunnen or the “Cycle of Money” Fountain. It depicts many characters passing and exchanging money, showing it flow ‘around and around’ with the water which it all ultimately goes down the drain in the middle. Kind of makes you think. You can find it at Ursulinerstraße, 52062 Aachen. We found this fountain near the Cathedral and Lisa really liked it so we took a photograph. It’s covered in little birds but we didn’t actually see any water running to it – which makes us think it’s not a fountain (but it’s named as one). In any case, it’s neat for a photo. You can find it at Spitzgässchen, 52062 Aachen. All this talk about Aachen being a famous place for hot springs and thermal baths means that you should probably visit one of the baths when you visit! The Carolus Thermal Baths are for you then! This wellness and spa complex is located just outside the main city centre in the city park or “Kurgarten”. This beautiful complex features numerous indoor and outdoor pools of various temperatures, a spa, sauna, beach area, relaxing rocky grottos, and much more. You get to relax in mineral-rich water that has been sought after for healing properties for over 2000 years in Aachen. There is even a local bus/train ticket called “Ticket to Wellness” that covers your bus or train to Aachen from within the Aachen city transport area, a 2.5-hour stay at the Baths, and a return ticket home! It’s sold in the AVV machines and on buses. To check out the prices and the opening hours for the Carolus Thermen, you can visit their official website. Located near the Hühnerdieb, this museum is dedicated to showing off Aachen history that is a little more recent. The house is from the mid-1600s and included furnishings, decor, sculptures, and more from various eras. They make a point of showing what life was like in the 18th and 19th century which is neat. The museum is part of the “Route Charlemagne” which showcases other historical stops in Aachen – many of which we’ve already mentioned. For admission prices and opening hours, here is the official website. Inside the Nobis Printen near the Aachen Cathedral. 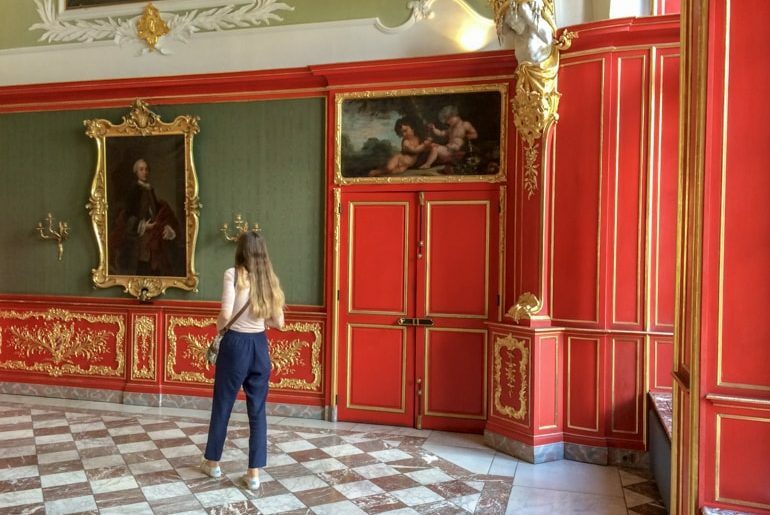 This one is a mix of things to do and something to eat, but since Printen are such a big thing in Aachen, we decided to include it in this section. Admittedly, Lisa – being German herself – had never heard of the word “Printen” before moving to the Aachen area. Apparently, it is a special type of brown gingerbread cookie and there are lots of different versions. We have seen them but have yet to try them since we decided to wait for the winter time which seems like a better time of year to try them than the middle in the summer. However, if you’re only in Aachen for a short amount of time you should probably try one! The busy pedestrian mall with lots of shops, food, and often street performers. If you’re in Aachen and you want to do a bit of shopping, this is the place to do it. Adalbertstraße runs a great length through the middle of the city (more east of the Old Town, though) and has lots of the popular shops you might be looking for. There are larger malls and department stores as well. If you need a snack, you’ll find a few food places with classics like French fries and ice cream. You can even relax at one of the many sit down cafes in the area. Behind the Elisenbrunnen – with the Cathedral peeking out over the trees! Behind the Elisenbrunnen is a nice park for you to relax and enjoy. We walked through on a sunny day and there were lots of people relaxing on the grass, enjoying a coffee on the cafe patio, or just passing through as well. Very old artefacts in the original dig site at Archäologische Vitrine. 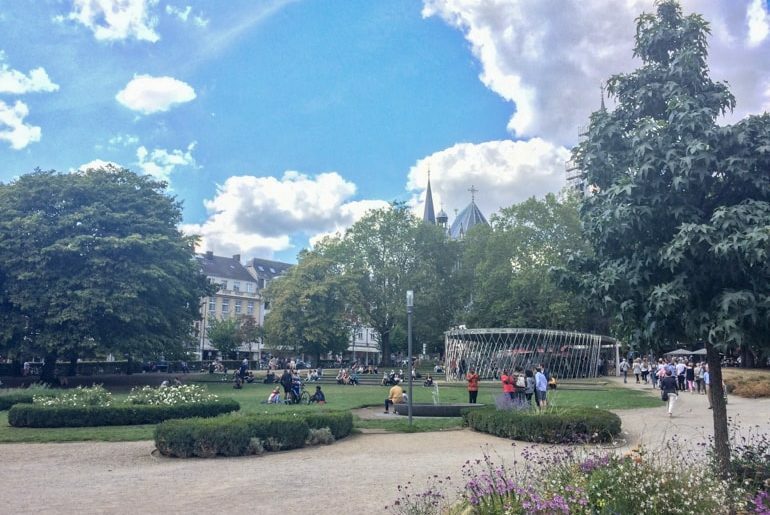 If you walk further into the park closer to the Old Town and the Aachen Cathedral, you won’t miss the glass and metal structure popping out of the grass. We checked it out because we were curious. Turns out, it’s an Archaeological Display Case showing the exact area where archaeologists have dug and found very old remains from the past! In this particular pit, there are old stone walls, a few tools, and other items – each with German and English on the glass in front of you to read about. We’ve explored Aachen a few times but usually, it’s been during the day. That said, we have yet to go out for a nice dinner in town. We do know, however, of a few places to go for lunch for a coffee, and have even scouted out a few places that we know we WANT to go to when we have the time and we’re staying late in the city. There are MANY places to choose from for a quick coffee or a nice lunch. Right in the heart of the action in Marktplatz, you will find lots of cafes and other places to grab a bite to eat. We haven’t sat down in this areas because we had things to see and do and we already had a lunch spot picked out for the day. That said, we will come back on a sunny day and have a beer or a coffee in the square. Our Americanos with their little biscuit – a very good spot! We accidentally stumbled upon this cafe when walking from the Old Town to the main train station (to the south of the Old Town). 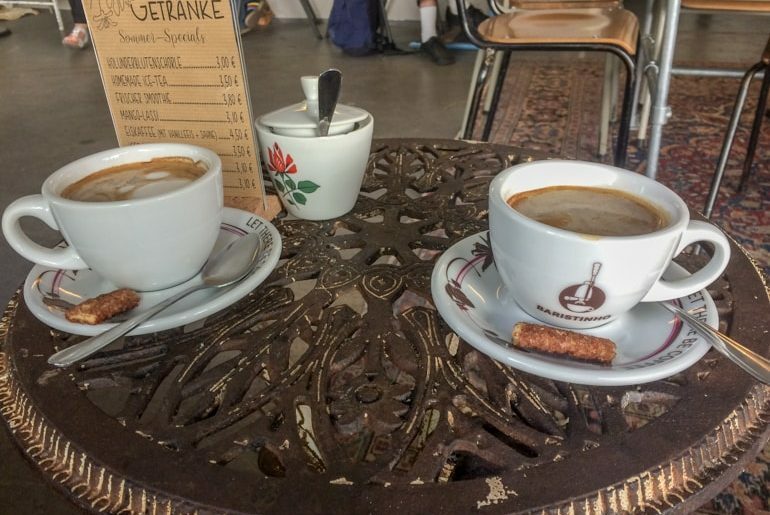 We liked the look of Baristinho – just a simple coffee place. So, we decided to stop in. The place had street seating at little tables but we opted for comfy chairs inside. There is also lots of space inside the cozy but bright cafe. The coffee wasn’t too expensive, and the staff were very friendly. We had simple coffees but APPARENTLY, you go there for cafe lattes because literally, everyone was drinking one except for us! Baristinho also prepared bagels and sandwiches fresh in the cafe and they looked really good! The “Classic Quebec” poutine tastes good – but it’s not real poutine! Located very close to the shopping street and on the edge of the Old Town centre in its own small glass building, Frittenwerk serves up what they call “Canadian Street food”. In short, they do poutine! We actually had it in Düsseldorf and it wasn’t too bad. However, to call their product “poutine” is incorrect. What you get is tasty fries with gravy and a soft cheese. Don’t get us wrong – it’s tasty – and they have other toppings and styles as well. But, for real Canadian poutine – it’s just not. 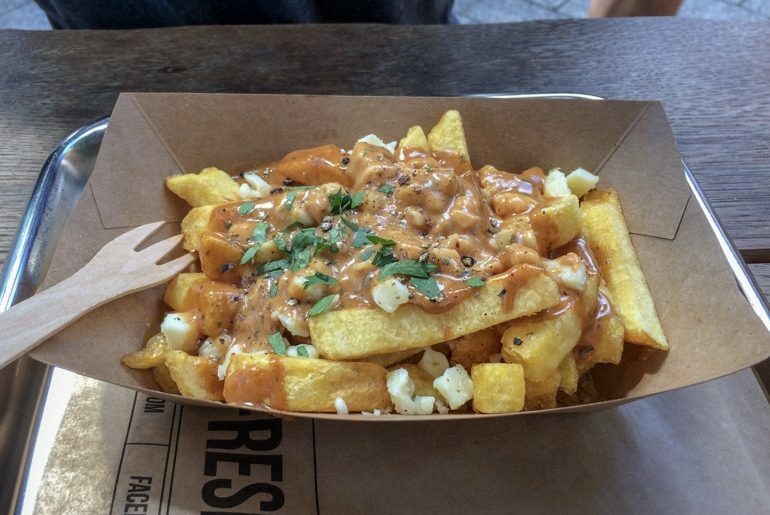 The kind of cheese isn’t just right, the fries are too big, and the gravy isn’t piping hot. It has to be burning hot to melt the cheese – that’s the whole point! So, we were a little disappointed but it’s still worth to try. Just don’t think it’s real poutine that you’d get in Canada. This is a craft beer place that we have walked by about three times now. Each time, Eric has commented on how he really wants to go – but we have always been heading out of town! The last time we went by the people outside had a massive flight of like five beer for sampling. Upon further research, the reviews of the place are just glowing. They have lots of beer on tap, in bottles, act as a beer shop, and allow for tastings and other events, as well. So, we’re going to make a point to head into the city for drinks one evening and try it out! You can see what we’re talking about at their website. 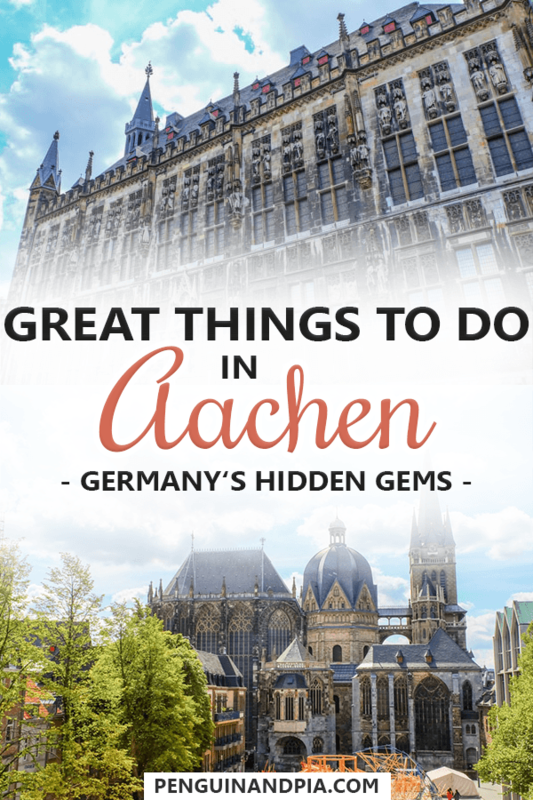 And there you have it – some of the best things to do in Aachen! We live quite close by so we get the chance to discover it more and more each time. That said, as we do more things we will add them to this post so you have the best list around! Have you been to Aachen? Maybe you’re planning a route around Germany? Let us know – we’d love to help you plan a great German adventure.